The 5 Best Gelato Places in Arkansas! Gelato is one of the best sweet treats in the world. And you don’t have to travel all the way to Italy to get it! Rest assured, however, you can actually get some of that delicious Italian-style ice cream right here in Arkansas if you look hard enough. Here are the best places to find gelato and other Italian-style ice cream treats in the Natural State. This hot spot (or should we say cold spot) in Hot Springs has been passionately crafting Italian ice cream since 2007, when gelato became a reality in this iconic city. When you walk in the door at Dolce Gelato, you are greeted by a cozy atmosphere filled with the aroma of freshly made gelato and freshly ground coffee beans. One glance at the colorful display of gelato is enough to make your mouth water! 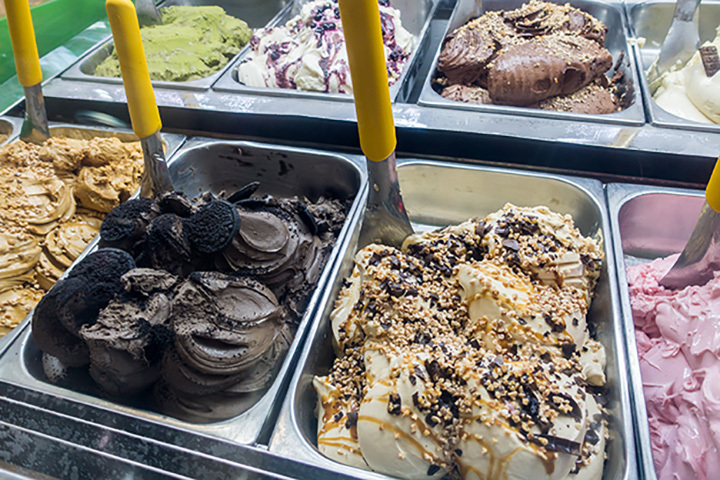 Dolce Gelato features more than 24 varieties of homemade Italian-style ice cream that are available daily. The folks at ZAZA’s are up bright and early each day making fresh gelato. Made with whole milk rather than cream, the gelato served here has half of the fat as American-style ice cream. In addition to milk, ZAZA’s gelato is made with other premium seasonal ingredients like, berries, nuts, all natural cane syrup, and fruits. Conveniently located on N. Crossover in Fayetteville, 3 Crazy Berries has made a name for itself in the Arkansas gelato scene. This popular frozen-yogurt shop is best-known for, well, for frozen-yogurt. But with flavors like yellow cake batter and red raspberry, you can bet the gelato at 3 Crazy Berries is good too! While the available flavors vary, the gelato and sorbet served here is made fresh onsite each day. The Italian ice cream at JavaPrimo is so popular that it is also available for purchase by the liter. JavaPrimo has two locations in Arkansas: on Central Ave in Hot Springs and in historic downtown Arkadelphia. Described as the “Koolest Place in Town!” Freddo’s Frozen Treats is serving up the best in cold desserts. Flavors rotate, but you can expect to find gelato flavors such as toasted coconut, pineapple upside down cake, and French vanilla. This place is to die for.